One of the things that intrigued many first-time visitors to KHSU for the past few decades was the fact that KHSU was located in two different places: the studio facilities were situated, as they have been since 1960, on the third floor of the University's Theater Arts building; the office was in the Wagner House on the edge of the Humboldt State University campus since 1987. The house was built by Thomas Anderson in 1883, and the Anderson and Parton families lived there until the 1940s. The last occupants of the house were HSU music professors Leon and Jean Wagner and their family. KHSU's business offices are located in the Wagner House on L.K. Wood Boulevard on the HSU campus. The house was built in 1883 by Thomas Anderson. Until a reorganization of KHSU in 2019 (see below), the studio and office had not been co-located since the mid-1980s. In the late 1980s, plans were drawn up for an elegant state-of-the-art broadcast suite high atop the Theater Arts building. The project was slated to begin with the fiscal 1994 budget. However, at the dawn of the last decade of the 20th century, the project's major funder, the State of California, experienced serious budgetary problems and the project was put on hold. But budgets and buildings come and go. It is the intimate nature of radio that captures the hearts and minds of listeners. And it is this non-tangible essence of radio has kept KHSU vital for more than 50 years. Radio broadcasts from Humboldt State College (HSC) were sporadic in the 1930s. One of the earliest reported broadcasts of that era consisted of a half hour mix of sports, music (Charles Fulkerson playing the piano), and talk (an address by HSC president Arthur Gist and an explanation of freshman-sophomore hazing). Humboldt State College was on the air. Its purpose: to publicize the university. Newspaper article on one of the first radio broadcast from Humboldt State College. Radio classes became part of HSC's curriculum in 1941. A studio was set up by the northeast stairs in Founder's Hall. Don Karshner(Drama and Speech chair) and John Van Duzer (Assistant Drama professor) painted, bought carpet, and covered the walls with burlap. The first broadcast of the HSC Radio Workshop was heard on KIEM radio October 30, 1941. The broadcasts at this time were fed through phone lines to KIEM's transmitter in Eureka. World War II interrupted the status quo, and radio at Humboldt was on hold. Following the war, the California Department of Higher Education concluded that HSC was the appropriate campus to develop a radio program because the campus' remote, rural location meant that graduates could find immediate employment in the small local market. On December 1, 1947 KHSC-AM signed on as a 10 watt carrier current station providing campus-wide coverage. Since its signal was transmitted through the campus electrical system, KHSC was not technically or legally a broadcast station. HSC's "Radio Shack" stood on campus where music practice rooms stand today. The modern era of broadcasting from Humboldt began in January, 1955 when the station's first transmitter, built by Dr. Roscoe Peithman and his electronics class, became fully operational. On March 14, 1955, KHSC initiated its first regular broadcast schedule, programming six hours a day, weekdays, under the direction of Dr. William Ladd. On January 22, 1960 KHSC moved into the present KHSU studio location on the third floor of the Theater Arts Building and filed an application with the Federal Communications Commission for a 10 watt educational FM license on 90.5 megahertz. And on October 17, 1960 KHSC-FM signed on as the first licensed non-commercial FM station in the California State University and College System. Broadcasting Monday through Friday from 3 to 9:30 p.m., the station covered most of Arcata and the immediate area. Things changed in 1969 when a complete package of television equipment, purchased in 1963, blew its tubes, and the TV program at HSC was phased out. Many broadcast students had deserted radio for the glamor of television, and class reductions had led to funding reductions. As broadcast students flocked back to radio, they found a program with few classes and ancient equipment. In 1971, the phase-out threat was extended to radio. Everything that had been bought in 1959 was worn out and faculty advisor Goodrich asked for $3,285 to replace the equipment, which should have been replaced six years earlier. He was given $500, at a time when an unprecedented number of students - 80 - were using the station and broadcasting more hours than ever before - 77 hours per week. Funding continued to be an obstacle, but when KHSC moved from the auspices of the Theater Arts Department to the Speech Communication Department funds became available which enabled the station to remain viable. The call letters became KHSU on October 4, 1972 reflecting the change from Humboldt State College to Humboldt State University. The station's popularity on campus soared. In the spring of 1976 a student services poll asked students to rate campus services. KHSU was rated highest (followed by financial aid and the Lumberjack). 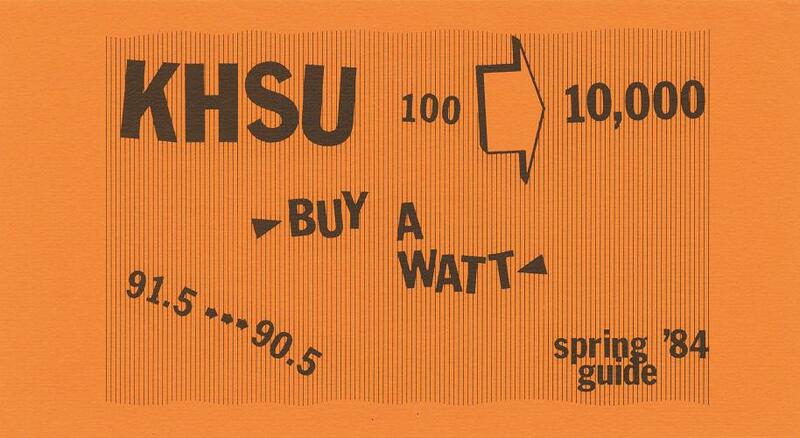 Reflecting the students' commitment to their radio station, in 1978 the HSU Associated Students purchased a new solid state transmitter and stereo generator, and on October 9 the first stereo broadcast was heard on KHSU-FM. The station began broadcasting 24 hours on weekends and lengthened on-air time to 20 hours a day Monday through Thursday. By the next year, in addition to money from the University and Associated Students, KHSU was funded by underwriters, advertisers in the program guide, benefit concerts, and the Friends of KHSU. KHSU's first "Marathon," aka Membership Drive, took place December 6-14, 1979 and raised $7500 in pledges. 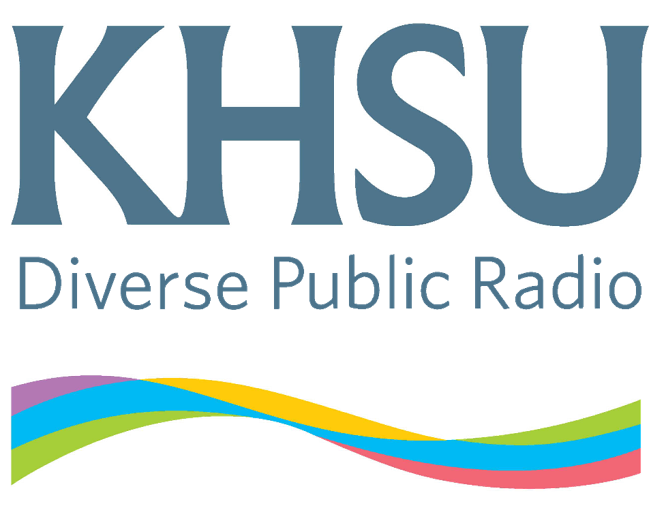 It was here when KHSU became a member-supported radio station. The October 4, 1982 power boost to 100 watts expanded the coverage area to a ten-mile radius of campus and KHSU began broadcasting at 91.5 megahertz. The student electronic sandbox era was drawing to a close. As the campus station reached deeper into the community, listeners were sometimes offended, and "professionalism" became an issue. KHSU had reached a new plateau in its evolution. August, 1983 was a landmark month. On August 1, KHSU received a $57,000 grant from the National Telecommunications Information Administration (NTIA) to be used for a power increase, satellite downlink facilities and new studio equipment. Additional monies, from a variety of local sources and fundraising campaigns, made the purchase of a satellite dish possible. Then, on August 30, KHSU received FCC approval to construct a 9,000 watt radio station. As the first broadcast of the old HSC Radio Workshop was heard in October of 1941, so it was that in October, 1984, radio from Humboldt took another leap. On October 1, KHSU aired its first satellite program: National Public Radio's (NPR) All Things Considered. And on October 3, 1984, at 10:20 a.m., KHSU began testing, back on 90.5 FM--at 9,000 watts. KHSU could now be heard as far north as Gold Beach, Oregon and south down the coast into Mendocino County. The signal could often be heard as far east as Willow Creek. In 1987, C. Parker Van Hecke arrived from Alaska as the new general manager. Van Hecke's mandate was to make KHSU grow. Ties with the Speech Communication Department were severed, and on January 1, 1988 KHSU became an independent entity, with direct responsibility to the Dean of the College of Arts and Humanities. The time was ripe for KHSU to become fully CPB (Corporation for Public Broadcasting)-qualified. The only requirement the station still needed to meet for qualification was having five full-time paid employees. Van Hecke was unwilling to wait for the University to fund additional state positions at the possible rate of one per year, and so, by reconfiguring budget allocations to cover those salaries, in May of 1988 KHSU was able to become fully CPB-qualified in only five months rather than five years. CPB qualification made the station eligible for federal funding. Broadcast quality and community outreach became KHSU's prime goal. "We're not talking about a student training program any more," Van Hecke stated. "My main concern is to serve the public." Student involvement needs to become more sophisticated." The new management team toughed out a flurry of criticism and demands from both students who felt that KHSU was their station and from the greater listening audience which now had a public radio station with high quality local and national programming. KHSU began reaching out to even farther segments of the community in July, 1990 when construction of three translators began. Thanks to another NTIA grant received in 1989, KHSU can be heard in the Ferndale/Fortuna area, in Garberville and in Willow Creek. In 1995, KHSU began significant equipment upgrades, including a new main antenna to replace the weathered and aged structure on Barry Ridge in Kneeland, a digital FM exciter, and new translator equipment in Willow Creek. These projects were made possible by a grant from the NTIA/PTFP, plus matching funds from the community raised during the 1995 Spring Membership Drive. The drive was the most successful in KHSU's history to that point, raising over $53,000. Other equipment upgrades that year included changes in the satellite downlink equipment which enabled KHSU to receive its first digitally transmitted program from National Public Radio in July, 1995. More contributions from members and NTIA/PTFP made it possible to replace the on-air audio console and upgrade other studio equipment in 1996. KHSU began its second significant signal expansion project in 1994, applying to the FCC for permission to construct a "repeater" transmitter and auxiliary studio in Crescent City, California. Funding assistance was sought from NTIA/PTFP, as in previous major construction projects. Both federal agencies gave final approval to the project in late 1997, and KHSR-FM began broadcasting at 91.9 FM on July 26, 1999. 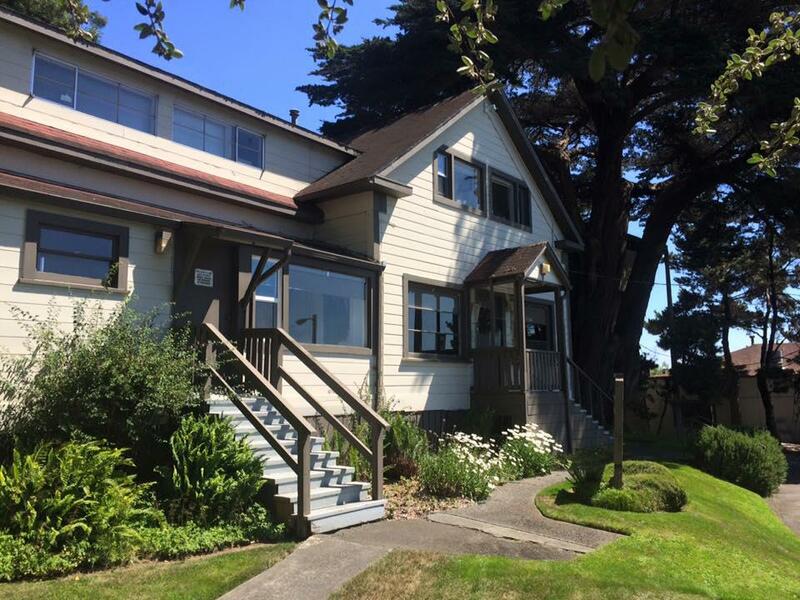 A small auxiliary studio was originally located at the office of the Del Norte Association for Cultural Awareness (DNACA), in downtown Crescent City. The summer of 1999 also saw an administrative reorganization for the station. KHSU, along with the HSU Natural History Museum and the University's First Street Gallery in Old Town Eureka, became part of the Office of University Advancement. The change recognized the importance of these programs' service to the university and the community as a whole, as opposed to a specific academic department or college. In 2010, as KHSU was beginning a year-long celebration of it's 50th anniversary, preparations were also being made to raise money to secure and improve signals in Southern Humboldt, the Eel River Valley and Del Norte and Curry counties as well as improve KHSU's emergency response with a new generator and make technological improvements to the studios. A capital campaign Into the Future was launched in 2011 and was embraced by many listeners and funding agencies. Station volunteers and staff raised $600,000 between individual contributions, grants and foundation support. With these funds, KHSU leapt forward technologically and also assured that public radio service would continue in the far reaches of the listening area. A permanent transmitter was placed in Garberville and Redway at KHSG 89.9 FM. The transmitter in Crescent City, KHSR, was moved and improved. A permanent transmitter and a translator both located above the Eel Valley at KHSF 90.1 and at 88.7 FM. A new transmitter was also needed at KHSU's main site serving the Humboldt Bay area. That site received an upgraded "HD" transmitter capable of sending both a digital and analog signal to radios. After a large earthquake in 2009, when KHSU was only able to stay on the air for 2 hours on battery power, the need for a dedicated generator at the studio was identified. The capital campaign fund, HSU and the state office of Emergency Services helped pay for back-up power dedicated to KHSU. This ensured that in emergencies and natural disasters, KHSU could remain on the air to provide information to the community. KHSU's studios received a facelift and new equipment that allowed staff and volunteers to produce programs and broadcast in three studios. The last piece of the capital campaign goals was to bring a new news service to the area. In February 2015, after three years of work and nearly losing the frequency, KHSU-BBC was launched. The station broadcasts the BBC World Service's full schedule along with some re-broadcasts of KHSU's public affairs programs. KHSU-BBC is broadcast on 103.3 FM on KHSM in McKinleyville and took one of KHSU's two Ferndale signals, KHSF 90.1 FM. The international news service can be heard from Crescent City to Scotia. In July, 2018, HSU President Lisa Rossbacher requested an external review of KHSU by the CSU Chancellor's Office. Specific concerns included whether KHSU was aligned with HSU's student mission, and whether KHSU was fulfilling a vital role in the community.